The first opera I ever saw was Richard Strauss’ rather obscure Die Feuersnot. I was nine years old and taken by my piano teacher to celebrate my admission to the choir I was about to join. Not that I was aware of it then, but that opera was conducted by Heinz Fricke, music director at the Washington National Opera. Earlier this week, the WNO arranged for a half-hour interview with Maestro Fricke. It ended up being a three-hour chat and forgot to ask my questions. Just before I left, I remembered this weeks’ WETA post, though, and asked whether there was any particular music for Easter that he liked. He thought about it for a while (which made me feel better because I still had not come up with much besideWagner’s Parsifal, Bach’s eight cantatas for Easter, the Easter-Oratorio, and the St. John Passion), and then added: Anything by Bach really. Maybe not the Christmas-Oratorio, but the only reason to exclude that is its name. Well, if intent or textual setting of the music are not the determining factors, but the way the music feels, I suggest that anything by Bruckner should be appropriate. Not the “Zero”, the First, and Second Symphony, Fricke contends, but the rest, yes, more or less. There is church in all of Bruckner’s symphonies, anyway, as he seems to have composed them all on the organ bench. Easter-music speculations didn’t go much further because with my suggesting the finale of Mahler’s third symphony, we are now talking ‘Bruckner-Mahler’ and all else is forgotten. (He loves the former but has never really found to the latter; I love the former but am obsessed with the latter). There are of course innumerable other works that are composed specifically for Easter, but I was looking for popular works that happen to be appropriate for Easter. Johann Pachelbel is popular, but not for his Easter Cantatas (but instead that massively overplayed Canon which, if I were never to hear it again, I’d be no sadder a man for it). They are lovingly recorded by Roland Wilson and La Capella Ducale on the CPO label. There is a stunningly well sung recording (ASV/Gaudeamus – Andrew Carwood, The Cardinall’s Musick) of William Byrd’s music for Easter (volume 6 of a series of all his vocal music), but Byrd is more likely thought to be a spelling mistake than a composer. Dietrich Buxtehude is known to organ buffs, but calling him popular would be missing the mark. He wrote a cantata cycle called Membra Jesu nostri; seven cantatas written about Jesus on the cross. Literally – because they are about looking at him, as observed from nearby, and categorized by body-part. (Feet, knees, hands, side, breast, heart, facial expression.) Cantus Cölln and Konrad Junghänel deliver this fascinating work with their usual consummate skill (HMU) and no baroque-lover in search for the slightly-off-the-beaten-path work should miss it. But I really just end up back with Bach. The Easter Oratorio is sometimes looked upon as a lesser work, because it’s put together from an earlier (secular – Bach only re-used from secular to sacred, not the other way around) cantata and therefore not very ‘original’. (Well, neither is the Christmas concerto, which stems from more recycled material than your average Yoghurt container, and we still listen to that without complaints, right?) It is rarely performed but you can enjoy it on record with Philippe Herreweghe and his Collegium Vocale (HMU). It’s a performance not likely to be bettered – and as all the best of Herreweghe’s performances do, it transcends the “period instrument” (or not) divide. Philippe Herreweghe and his group from Gent will come to New York this Easter Sunday and perform the other great Easter-appropriate work of Bach’s, the St. John Passion. To hear him with the musicians from the Collegium Vocale in this sublime work (which has no reason to shy from comparison with the mightier St. Matthew Passion) is a very special opportunity and it is difficult to put in words how much I am looking forward to Sunday at Alice Tully Hall. It is bound to be an event that will undoubtedly be musically gratifying – but also bring a spiritual quality with it that is extraordinary and fulfilling. It is not necessary to be of a particular creed or to believe at all: If you are open to music, the music of Bach (followed at some distance by above mentioned Bruckner) is the closest to a deep sense of – for lack of a better word – the divine that an atheist (such as I’ll openly admit to being) can come. There is not a group or conductor around whom I’d rather ‘receive’ this work from. With Konrad Jarnot (Christus), Christoph Prégardien (Evangelist), Camilla Tilling (soprano), Ingeborg Danz (alto), Jan Kobow (tenor), and Peter Kooij (bass) as his soloists and his fabled group, he is bound to create similar miracles that I know so well from his many records. If there are two conductors in Bach where I’d grab anything blindly and without sampling; Herreweghe is one of them. Karl Richter is the other – which goes to show that particular ‘style’ is not what defines greatness in this music (Richter is decidedly not a “Historical Performance” conductor), but inspiration, dedication, and quality. Or, with an eye to the choir and orchestral forces: It’s not size that matters, but what you do with it. That’s what I’ve always been told, and it seems to be true. None of his cantata discs are less than excellent; the cantata disc titled “Weinen, Klagen, Sorgen, Zagen…” is among the very finest I have ever heard of Bach on record. His St. Matthew Passion (either recording, but especially the second) must be among the three, four top choices, and wherever there is mention of Harnoncourt, Gardiner, Richter, or Rilling in Bach, there will also be mention of Herreweghe. Herreweghe seems on an unannounced and covert route to record all of Bach’s choral works (which is better than starting with great fanfare and then being yanked by your record label as happened to Ton Koopman / Erato – now fortunately continued and finished on Challenge Classics – and John Elliot Gardiner / Archiv – now re-released and finished on his own label, Soli Deo Gloria) and his St. John Passion is no less a success than any of the others. 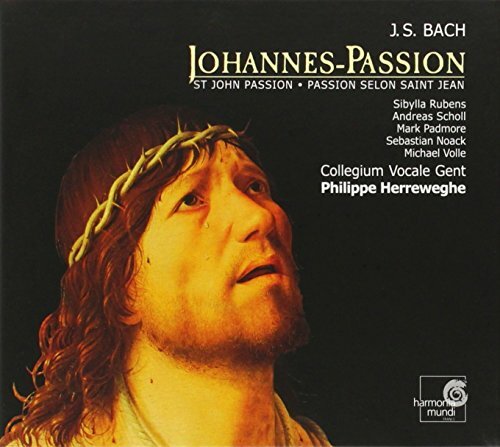 As with the St. Matthew Passion, Herreweghe has recorded the St. John Passion twice. The 2002 recording is not only his second version, but also Bach’s – the 1725, instead of the 1724 version is recorded here. The differences may be substantial in detail, but are not extensive… except where the massive opening chorus is replaced with a more humble version in the second version. I miss the full forces in that (and the) moment, but sooner marvel at all else than lament. The performance, on a technical level alone, belies the many stupid things that continue to be said about Original Performance Practice (pace Pinchas Zukerman – although one can admire that at least he has a point of view and vigorously defends it, rather than pussyfooting around like so many others, afraid to ever dare offend) and it aims straight for the heart. There is inspired singing (with countertenor Andreas Scholl capable of making you forget the contraltos you might be used to in arias like “Es ist vollbracht” – and Mark Padmore no less effective than, say, Peter Schreier), playing, and conducting on everyone’s part. It has been long since I listened to this, and I never got to compare it side-by-side. A friend, even more Bach-obsessed than I am (incidentally he is a Logician and Philosopher of Science, an occupation thatdemands Bach as its principle composer), had me listen to both of the latest Herreweghe Passions when they came out, and that was enough to leave an indelible impression on me. Anything I have heard since from Herreweghe in Bach has borne that out. Still, he is not the only game in town. I mentioned Karl Richter – and there are two ways to enjoy his Johannes Passion. His later recordings of the Bach works are largely out of print on CD – but some of them have just been issued on DVD by Unitel in collaboration with Deutsche Grammophon. They include the big three choral works (St. Matthew Passion, Mass in B-minor, St. John Passion), the Brandenburg Concertos, and a “Legacy of Karl Richter” disc. I have devoured them, but can’t deny having been slightly disappointed with the St. Mathew Passion and the Mass in B-minor in this set. Although the tempos are roughly the same and the singers excellent, there is something lacking here that is present on the earlier recording(s). Especially the 1958 Matthäus Passion is much more gripping and exciting than the (fourth) 1970’s attempt. But the “Legacy” disc, elsewhere dismissed as a hagiography (what did the reviewer expect – a critical retrospective on Richter’s difficult character? ), is very moving and insightful (and yes: uncritical), and his St. John Passion with Peter Schreier (Evangelist – strangely earnest, strangely believable), Siegmund Nimsgern (Peter and Pilate), Ernst Schramm (Jesus), and Helen Donath is gripping. The Münch’ner Bach-Chor is the real marvel, though, and not the least because of this DVD, my estimation of the St. John Passion vis-à-vis the St. Matthew Passion has risen immensely. Richter’s first recording of the St. John has been given a budget-CD re-release by DG and is, in its more sumptuous, slightly romantic (but never dripping over overwrought!) way something to behold. His soloists in Ernst Haefliger (Evangelist), Hermann Prey (Jesus), Evelyn Lear et al. need not hide from any other cast. Whichever your choice may be (perhaps you heard the Passion last Sunday at the National Cathedral – reviewed for the Washington Post by Joe Banno, who can say more in 240 words than I with 2000), whatever your creed or state of (dis-)belief: Bach should be as much a part of Easter and Pesach as the fuzziest bunny, or the most colorful egg, or the crunchiest matzah, or the fluffiest tsoureki. You seem to vastly de-emphasize the St. Matthew--and don't forget Christ lag in Todesbanden. And Handel had a hand in this game too--the Messiah is really an Easter oratorio, and there's also Israel in Egypt for this season. I've recently seen in the CD bins, but never heard any of it, an oratorio by Hummel entitled "Passage through the Red Sea" (actually, its German equivalent)--I think the label was CPO.